Page Street Publishing, 9781624142307, 256pp. Simone Miller is the chef and owner of Zenbelly Catering, a 100% gluten-free, Paleo-focused catering company, and she shares her favorite recipes on her blog ZenBelly.com. She is the author of The Zenbelly Cookbook: An Epicurean’s Guide to Paleo Cuisine and lives in San Francisco, California. Jennifer Robins is the founder of the popular food blog Predominantly Paleo and the author of Down South Paleo. She turned to whole foods following a life-altering health crisis and no help from traditional treatments. Her challenge resulted in finding creative ways to combine real ingredients to taste like old favorites. She currently lives in Arlington, Virginia until the next Air Force adventure begins! 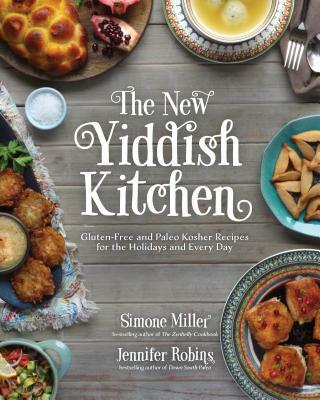 "In The New Yiddish Kitchen, Simone and Jennifer have brought the classics back to life, and back to the table. Flipping through the pages will take you back, and cooking these recipes will keep your belly—and your soul—full and nourished." "Bagels and cream cheese are back! With a focus on high-quality ingredients and solid technique, these recipes respect food, tradition and your health—while serving up deli dishes the Paleo world has been missing." "The New Yiddish Kitchen is a treasure trove of beloved recipes. You may just be interested in the amazing grain-free bagel recipes; those alone are well worth the price of admission. However, the real delight in this book is discovering the multitude of equally enchanting recipes, waiting to transport you back to your favorite bagel shop or corner deli. Filled with charming little notes from Simone and Jennifer's bubbes on many recipes, this book is as much a pleasure to cook from as it is to read."